I have a fun part-time obsession now-it’s knitting. Yes you read that right. I grew up crocheting and made a huge afghan during snowzilla in January. When I am visiting old town (Alexandria VA) I’d always walk by a really neat yarn shop and ladies (and some guys every now and again) would be sitting inside shop the shop knitting and crocheting away. 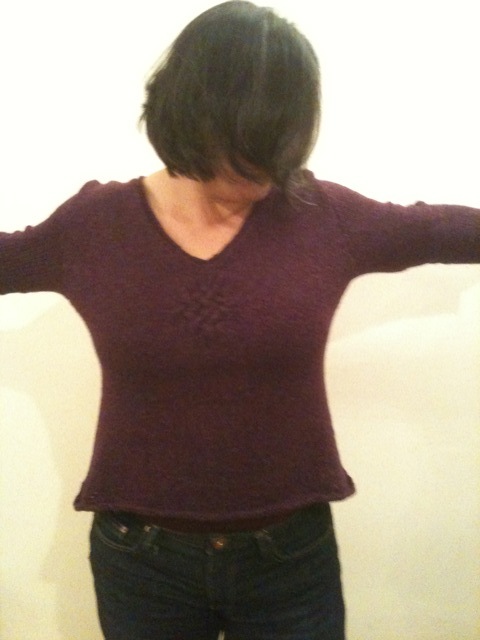 So I decided that this was the year I learned to knit. So far I’ve knitted a hat/slouchy beret and two kinda cute baby sweaters for friends. But my real obsession and the only reason I wanted to learn to knit at all was so I could learn to knit lace. To friends I’ve mentioned that to (at least the ones who didn’t ask what the hell was wrong with me since that’s an ‘old lady’ thing”) look at me and ask why not take up tatting. The answer to that is simple. I’d like to keep my eyesight thank you very much. 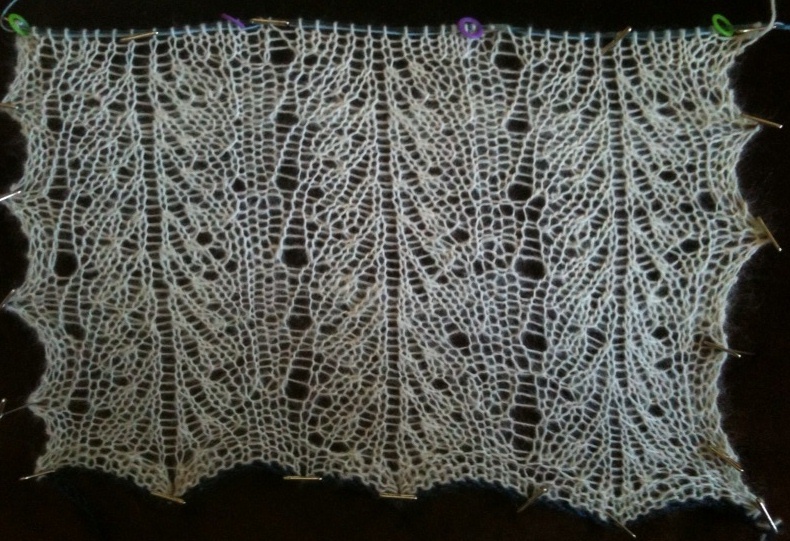 Ok, so here is the only lace I’ve knitted so far. I’m participating in a group knit along and we’re knitting samplers that will eventually be a stole. Since I am new to knitting this thing took forever even though its’ only 46 stitches wide and 68 rows tall. I’ve had to rip it out about 4-5 times and rip out pattern rows numerous times. It’s still not quite right, but I have to say that it’s magical pinning this and seeing some of the pattern revealed. I hesitated posting this here, but frankly I am really enjoying this so what the hell. Visiting some very close friends out west. Although its mind-numbingly hot here (ok it’s not as hot as DC) but cloudy-the day is beautiful in a weird way. 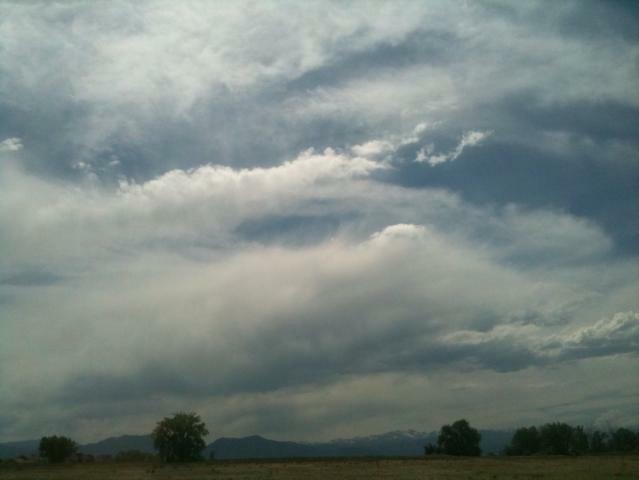 BTW, the mountains in the distance are the Flat Irons. 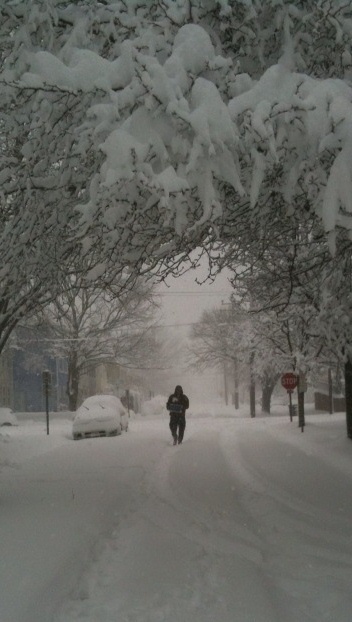 Due to the inclement weather, the Alexandria Art League has canceled the in-person registration. We must either fax our registration or register online. If you plan on faxing your registration you can use this form and print it out or register here. So no waiting on Liberace in the cold tomorrow morning. It’s going to feel really weird. Not sure how many people in my neighborhood are feeding the birds. We finally were able to get onto the deck and clear a feeding are and put out trays of bread crumbs, barley and other things. So far we’ve seen cardinals, chickadees, house sparrows, and this morning three blue jays. The starlings haven’t noticed where the food is but they are in the trees of a neighbor. Glad to have provided some food and shelter to the poor things, they are so puffed up to stay warm that it’s pretty funny. Next time I will make sure I have seed before the bad weather hits. Speaking of birds, we’ve fed them this winter. Last Sunday we saw a coopers hawk in our shrubs. He was losing a tail feather and was trying to pull it out. He eventually flew to the large maple out back (it’s about 120 feet tall) where he kept preening that tail feather. A young squirrel didn’t know what the hawk was and got pretty bold. He kept inching closer and at one point the squirrel was about 18 inches away from the hawk. The hawk was either full or too preoccupied with the tail feather to attack the squirrel. We had a house guest last weekend who is a wildlife biologist. All three of us watched this happen (he identified the hawk). I was amazed but even he said he’d never seen anything like it. BTW, the feather did eventually drop and is sitting on my desk! Well the snow started in earnest about 5pm last night. We hunkered down and watched TV or in my case I played world of warcraft for a bit. 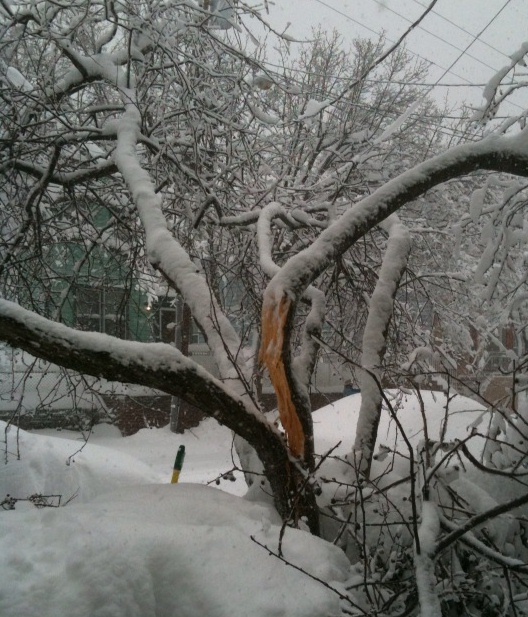 I wish I had gone outside and shaken or knock off the snow on the crab apple tree in my front yard. It’s now a probable goner due to the snow. The immense weight of the snow split one of the largest branches in half and it came down on our fence and the neighbors fence. I did go out today and knock the snow off the branch that was threatening to fall on a Mercedes parked in front of our place. Every time we try to dig out or at least shovel, the sidewalk is covered before we hit the end of the front of our home. The poor birds in the backyard have no food and with drifts of 3 feet I can’t even get the door open to give them bread crumbs or barley. They are hiding under the seats of our chair (we’d laid down newspaper to keep the food dry) and it’s providing them with tiny little caves. I’ve started a pot of chicken and dumplings and will probably make a pan of mac and cheese (with the smoked gouda) as well. Hoping we don’t lose power like those in MD.